As your dog starts approaching his senior years, you might start to see some subtle changes. Often it progresses so slowly that you don’t really notice it until one day you look at your dog and realize he’s aging and you might need to make some lifestyle adjustments so that you can properly care for your senior dog. In general, most dogs are considered to be seniors somewhere between 7 and 10 years of age. Larger breed dogs usually age faster than smaller breed dogs though genetics, nutrition and environment all play roles in how fast your dog ages. While a Great Dane is usually considered to be a senior right around 5-6 years of age, a small Chihuahua would probably not be considered to be a senior until he was 10-11 years old. That’s a big difference! So here are some signs to help you determine if your dog is approaching his “golden years” and also some tips to help you care for your senior dog. Just like people, dogs begin to show signs of gray hair as they get older. You might start to notice some graying around the muzzle, on their chest or on the top of their head. You might also see some graying throughout the coat, which is especially noticeable in darker haired dogs, and you may realize that your dog’s coat is not as shiny or thick as it was when he was a younger pup. While some dogs may prematurely gray at 2 years of age, most dogs commonly start showing signs of graying right around middle age (5-6 years old). 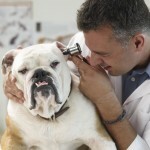 You might also notice that your dog’s hearing is not quite as good as it used to be. Maybe your dog is hard to wake up when he’s been sleeping or he doesn’t hear you when you come into the room. If you notice that your dog is showing signs of hearing loss and your vet has ruled out medical problems as the cause, you can help care for your senior dog by taking extra precautions to help protect him from hazards such as cars, children or other dogs that he may not hear when approached. Also if you haven’t done this already, it’s a great idea to cross train your dog on hand signals for sit, stay and come or get a loud whistle to use and train him to come to you when he hears the whistle. Another sign of aging that you might notice is that his eyesight may not be quite as sharp as it used to be and his eyes might even be a little cloudy or hazy. Have your dog’s eyesight checked by your vet to make sure he’s not developing cataracts or other eye conditions. Once your vet has ruled out any medical causes, you can help care for your senior dog by removing any clutter in the house, and also keep your furniture in the same place since your dog has a mental map of where things are. Keep his food and water in the same location so he can find it easily, and place barriers around pools, hot tubs or other dangerous areas where he might get injured. Also, you might notice that your dog is starting to physically slow down as he ages. He might hesitate as he lies down or gets back up, he might get tired more quickly when you take him for walks, and he probably does not play as much as he did when he was younger. Most likely you’ll see that he sleeps a little more and he also might start becoming a little more irritable or grumpy as he gets up in age. There might also be some signs of muscle atrophy and weakness, especially in the hind legs which is often seen in older dogs. Scheduling regular vet screenings is one of the best things you can do to help care for your senior dog. Your vet should examine your dog at least once a year, though many recommend a checkup every 6 months. Your vet can conduct a thorough exam to check for age-related problems, run a blood panel to check the liver, kidneys and pancreas and also perform vision and hearing exams. Your vet will also listen to your dog’s heart and lungs as well as check his skin, coat, eyes, ears and teeth to look for any potential issues that you can immediately address and will give you advice on how to best care for your older companion. For additional information, you can also read the guidelines for senior pet care recommended by the American Animal Hospital Association (AAHA). Regular dental care is important for dogs of all ages, but it is especially important for senior dogs. As your dog gets older, you’ll need to pay extra attention to keeping his teeth and gums clean and healthy with regular at-home brushing and regular dental checkups with your vet. After your vet has thoroughly examined your dog’s teeth and gums, he can give you a demonstration on the best way to brush your dog’s teeth at home. A great way to care for your senior dog is to brush his teeth at least 3 times a week using a toothpaste and toothbrush made especially for dogs. Most dogs seem to prefer meat-flavored toothpastes, such as chicken or beef, so if it’s possible try starting with a small sample first to see which flavor your dog prefers. You can read more about your dog’s dental care on our post “7 Important Tips on Dog Dental Care” here. As your dog gets older, you will probably see changes in his weight, so it’s a good idea to keep track of his weight gains (or losses) and also make note of any changes in his eating habits. Since senior dogs are generally less active than younger dogs, they are usually more prone to gain weight which can put more stress on their joints and body. Overweight dogs are also more likely to develop diabetes or heart disease, so it’s important to feed your dog carefully and make sure he’s getting the proper nutrition he needs without extra weight gain. Your vet will be able to help you choose an appropriate diet that is properly balanced for your senior dog’s special needs. 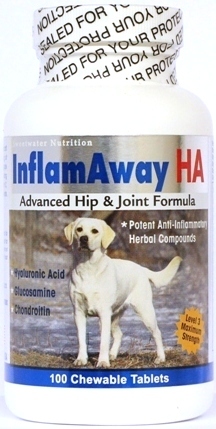 You’ll also need an effective joint supplement for your dog, and we recommend InflamAway HA joint supplements which contain key ingredients such as Glucosamine HCl, Chondroitin Sulfate, MSM and Hyaluronic Acid for dogs. Although you may be tempted to give your old dog a break from exercise and physical activities, regular light exercise is actually one of the best things you can do to care for your senior dog. Your dog may be slowing down, but that doesn’t mean he should spend all day sleeping on his bed. While your dog might not be able to go for long mountain hikes with you, just a few short, easy walks during the day will provide him with some well needed exercise that will help him stay sharp both physically and mentally. And just being outside in the warm sunshine and fresh air is always good for his well-being! You might need to make some adjustments around the house to help your dog stay more comfortable as he ages. Older dogs are not able to regulate their body temperature like they could when they were younger, so it’s important to keep them indoors when it’s either extremely hot or humid outside in the summer, or cold and wet in the wintertime. Your dog may need some extra blankets in his bed for comfort, or may need some extra support provided by an orthopedic foam bed. There are some beds that help distribute your dog’s weight evenly and reduce pressure on his joints, plus they are easier for your dog to get out of in the mornings. Your dog may also have a hard time getting up and down stairs, so you might also want to give him access to a ramp to help him get around. Another idea is to get an elevated feeder for your dog which makes it easier for him to reach his food and water especially if his back or neck is stiff. And lastly, give your dog the same love and attention that you did in his younger days. You can still play with him, pet him, spend time together…there’s a reason why it’s called “The Golden Years”. Tell us about your senior dog – we’d love to hear your stories! CompleZyme PlusHelps maintain healthy digestive function Ideal for … Learn More! Super Oxy Green Antioxidant for Dogs Advanced Supplement with Superoxide Dismutase Super Oxy … Learn More! Vital Pet Yeast Free Vitamins For … Learn More!